Unfortunately health issues have forced me to concede that it is time to stop riding. Many of you have seen this bike at the 2017 WCR. Only change since then is the addition of a RPM oil filter adapter and 1000 or so miles. 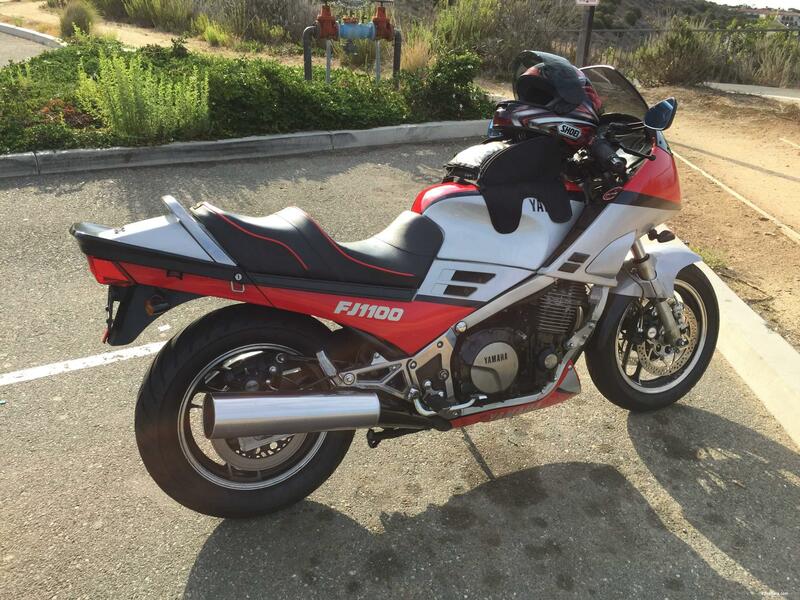 Bike is located in Torrance, CA. Has 45,750 miles, starts quickly, and runs great. I bought the bike from an old friend who was the original owner 13 years ago. Lots of RPM parts and OE Yamaha parts installed over the years. Rizoma mirrors, Corbin seat, tinted windscreen - and have all the original parts, too. Have a set of Pirelli Sport Demons ready when the Avon tires need replacement but they still have a lot of tread left. Also have a new Wilbers rear shock I was going to install but never got around to it. Asking $2000 for everything. Will even throw in almost new Schuberth helmet and riding pants if they fit you. Ph 256-810-4472. 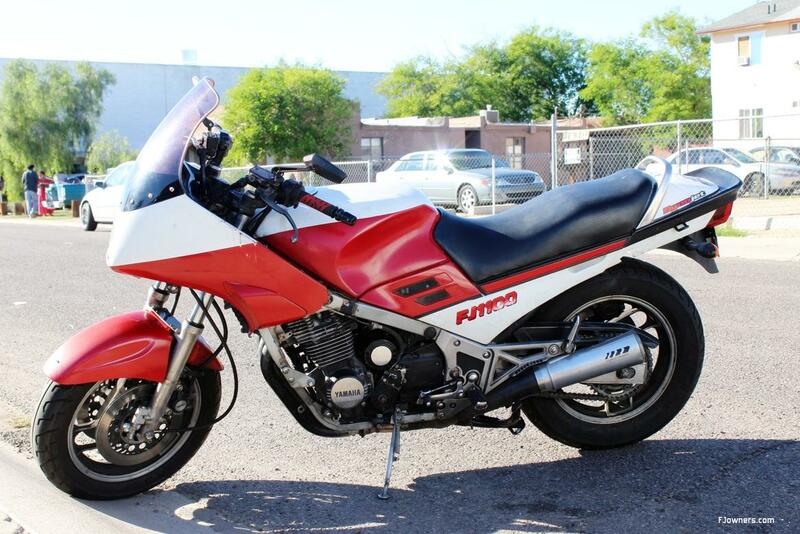 Great looking bike and great price for someone looking for the best color FJ. Unfortunately health issues have forced me to concede that it is time to stop riding. Sorry to hear that, I'm sure it's a thought that crosses many of our minds from time to time. I hope you find a buyer that will do justice to such a fine example, it's a credit to you. Here's another shot. I think my photos may be too large to post multiple pictures at one time. Carbs were rebuilt and re-jetted a few years back. Had the valves adjusted and carbs synced at the FJmonkey garage a year of so ago. Has the RPM oil cooler, RPM fork brace, RPM pod filter, RPM cam chain tensioner, new iridium spark plugs. I was just recovering from carpel tunnel surgery and feeling strong enough to get back on the bike when I had a severe retina detachment and tear - for no apparent reason - just happened out of the blue! Go back to the doctor's office Monday to have more laser surgery and or possibly be referred to the hospital for more involved surgery. Scary stuff. I guess if there is something I can offer up as advice it is this: Any loss of vision is a medical emergency. Don't be satisfied with some future appointment with an ophthalmologist. Get help immediately. Tim, I’m very sorry to hear about this. I know you love that bike. We will get her to a good home. There’s this kid I know out in Arizona who happens to love FJ1100’s. Good call Pat. That thing belongs in the fold. Wonderful bike! The exact year and color I lusted over in high school the first year they came out. Looks in great shape too. If you weren’t on the other side of the continent and in a different country, I might have already been at your door! Good luck with the sale and I hope whoever buys it appreciates it for what it is. Best wishes for you and yours with the health issues as well. Thanks for kind thoughts. Pat, you're absolutely right! Funny how a machine can become such a valued member of the family. I really do want to find her a good home. The FJ is headed to her new home. I look forward to following Ryan and his plans to get some upgrades and repairs done to the bike. Thanks to everyone here at the FJ owners website. It's been a blast! Dude, that bike couldn't have found a better home. I know Ryan is on cloud nine! Take care Tim. You bike is in good hands. Our time together was short...It was a pleasure to meet you, ride with you up to and back from the WCR. Hey all, needless to say, I am THRILLED to have been able to get this bike. Big thanks to Tim for working with me on pick up and scheduling, and for all the knowledge he was able to give us on the bike. I'll be posting some photos of the trip and pick up soon. I'll take good care of her for you Tim! !